hello, broke a axle few weeks back. ordered 2 new rear axles (went with moose oe replacements) upon installing the rear left axle found the knuckle bearing was seized. ordered 2 new rear knuckle bearings. 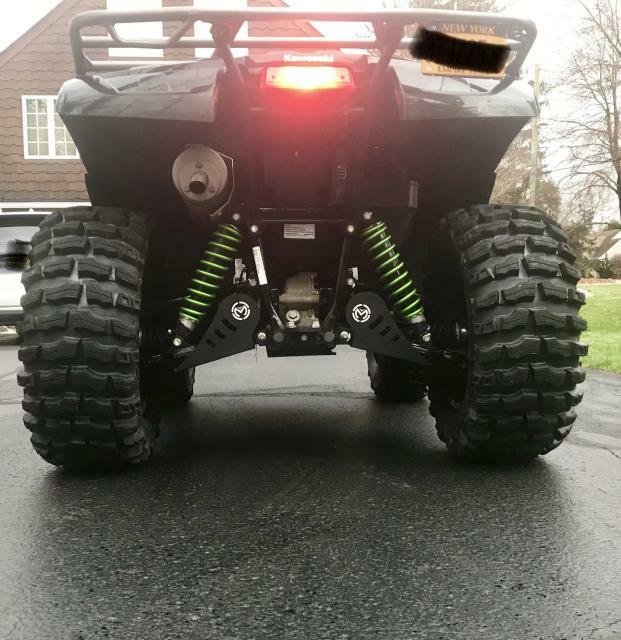 finally came in today... after getting both rear bearings and axles installed im now noticing the left rear wheel toes slightly in at the top towards the frame. its only the left wheel the right sits straight. I never noticed it before but cant confirm it was this way before the repair. is it possible I could have bent the knuckle pressing the bearing out? I used my shop press. I did both knuckles the same way and never felt either knuckle was being stressed with too much pressure, bearings popped out and new ones back in with ease. I would imagine with the knuckles being cast aluminum they would break before they bent? any tips on what could be the cause or how to correct this issue? I attached a photo but its hard to tell. Well, "Toe" actually means the difference from front to the back of the tire, not the top and bottom. That is your camber angle, and in truth all brutes have some negitive (tipped-in at top) camber angle. They do this for stability. This can become more pronounced with aftermarket wheels with more offset to the outside and warn or damaged upper a-arm bushings. Also a bent a-arm or frame mount can change it as well. Do this: ride it around a bit and pull it back where it is now, get off and take a look. Almost bet you find its better. I'm also assuming you double-checked that one knuckle didn't get flipped. Thanks for quick response. Yes the knuckles have clear arrows pointing up. I plan on hitting the trails this sunday, hopefully it gets better like u say. So, the negative camber isn't something to worry about, like putting extra strain on the axle? I have a trip planned for next weekend just want to make sure my brute is in perfect shape. don't want to drive ten hours and have issues!! Nope...and actually if you put weight on it the natural arc of the travel will make it go positive...or at least toward the positive. Sitting there with no weight on it and the shocks topped-out it will be at the far end of its travel and at it's worst. Get someone large enough to make the suspension go down some and move it a little, then take a look. You'll be surprised. Besides, even if it didn't, the CV joints would make up for any angle change.